"I was born when she kissed me. I died when she left me. I lived for a few weeks while she loved me." Director Nicholas Ray doesn't have the fame and reputation of some of his contemporaries (like Billy Wilder or Alfred Hitchcock), but he should. His most famous picture is probably Rebel Without a Cause, that James Dean paean to adolescent rebellion, but even better than Rebel is this movie, In a Lonely Place, an odd and moody film noir from 1950 starring Humphrey Bogart in one of his best and most revealing performances. Bogart plays Dixon Steele, a reasonably successful screenwriter, with an agent lining up a new job for him: a big shot producer has bought the rights to a popular novel, and Dix is hired to write the adaptation. The principals rendezvous in an industry hangout, and Dix can't be bothered reading the book, so he makes other arrangements: the coat-check girl, Mildred Atkinson (played by the delightfully named Martha Stewart) has read it, so Dix coaxes her over to his place to tell him the story. Mildred thinks this might be more than just a business arrangement, and she's right—though Dix does no more than ply her with ginger ale and provide her with cab fare home, she ends up dead before sunrise, her body disposed of in Benedict Canyon. The cops come calling, and Dix doesn't seem too bent out of shape by the news—could he be guilty? Luckily for him, he's got a safe and pretty alibi from across the courtyard—one of his neighbors, an aspiring actress named Laurel Grey (Gloria Grahame), saw Mildred leave, without Dix, putting the writer in the clear. The cops still have their suspicions, though, and Dix is still under investigation. Much of the movie is devoted to the courtship of Laurel and Dix, with of course the black cloud of the murder hanging over them. What's curious is that Dix isn't especially interested in the murder, and neither is the movie—it's principally a character study, and not much of a whodunit. Even more peculiar is that it feels as if the point of view of the movie switches in midstream—at the opening, Dix is clearly our hero, unjustly accused of a brutal crime. But somewhere in there, our sympathies flop over to Laurel, as we discover that Dix has a nasty temper, a history of violence, and some serious intimacy issues—it's entirely possible, in our minds and in Laurel's, that Dix is in fact the murderer the police lieutenant suspects him to be. It's hard not to draw comparisons between this movie and Sunset Boulevard, another film made the same year with a screenwriter as its main character; but somewhere along the line, it becomes much more like Suspicion, with Joan Fontaine wondering if Cary Grant, her perfectly charming husband, isn't trying to kill her. It's most compelling as a psychological portrait of the deeply troubled Dix, who gets attention from the wrong women, can't write unless he's in some sort of frenzy, and sows the seeds of destruction of the one relationship that could save him from his demons. Bogart is pretty extraordinary here, quick to violence, then immediately racked with guilt—he knows he's his own worst enemy, and there's not a damn thing he can do about it. Grahame is fine as his smitten and then doubting counterpart, and there's also excellent work from the supporting cast, especially Frank Lovejoy as the improbably named Brub Nicolai, an old war buddy of Dix's now investigating him for the Beverly Hills Police Department, and Jeff Donnell as Brub's wife, Sylvia. It must have been a unique sort of hell for Donnell to try to make it as an ingénue in Hollywood with Jeff as a first name; she also has a special place in my heart for playing Sidney Falco's simpering secretary in Sweet Smell of Success. Image Transfer Review: As the supplemental material makes clear, a tremendous effort went into cleaning up a badly damaged print for this release, and it shows—the contrasts in the handsome black-and-white photography are shown off to great advantage, and the slats of light spilling into the rooms and onto the characters perfectly evoke the necessary atmosphere of noir. But even the best restorers aren't alchemists, and occasionally the picture quality looks a little dull, with some flecks in the print. Audio Transfer Review: Many, many clicks and other nasty bits of interference were removed for the DVD, and the movie sounds mighty fine, though of course it's still of its time, which means that the mono track has its limits. But the dialogue is all readily distinguishable, and reasonably well balanced with George Antheil's memorable score. In a Lonely Place: Restoration Story (05m:19s), is a nice, brief look at the work done on the damaged source material by Cinetech (who restored the picture) and Chace Productions (who restored the sound). There's also a look at The Bogart Collection (04m:22s), memorabilia from Bogie's films for Columbia, which also included Sahara, Dead Reckoning, The Caine Mutiny, and The Harder They Fall. A bruising character study first and a mystery almost by accident, In a Lonely Place displays some of the finest work you'll see from its legendary leading man and underappreciated director. 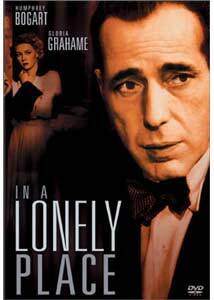 Sony deserves praise for taking the time and care with the extensive restoration of In a Lonely Place, which may not be a perfect movie, but is liable to haunt you nonetheless.